The winners of the BUSHNELL Scope with tripod and the BUSHNELL Binoculars at The Friends’ Spring Birding Raffle are both keen birders and will be putting their prizes to immediate use. Joyce Boucher presents Cheryl with her Bushnell Scope. The winner of the Bushnell Scope is Cheryl Mound, from Stirling. Married to Bob, who has been a birder all of his life, Cheryl took up the hobby around fifteen years ago. 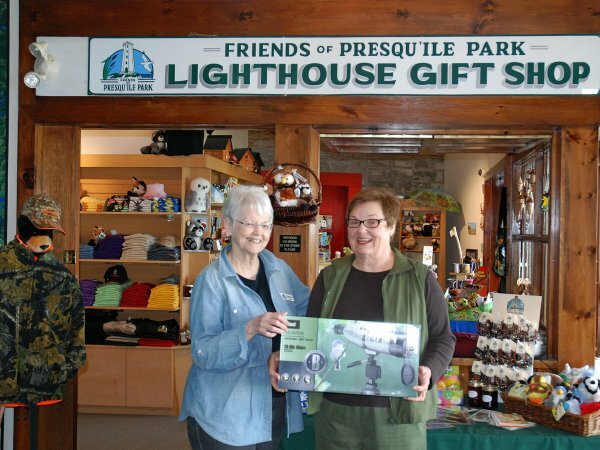 Presqu’ile is very important in their lives and is a regular destination, as Bob was born in the area and his father Ted at one time managed The Codrington Game Bird Farm. Cheryl is very grateful to the regular Presqu’ile birders, who have become good friends and helped her develop her skills. It just so happens that Cheryl and Bob are planning to visit Cambodia, and the newly established Sam Veasna Conservation Organisation, where guides are trained and provided for keen birders. Cheryl plans to leave her scope there as they are a fledgling organisation and need support. 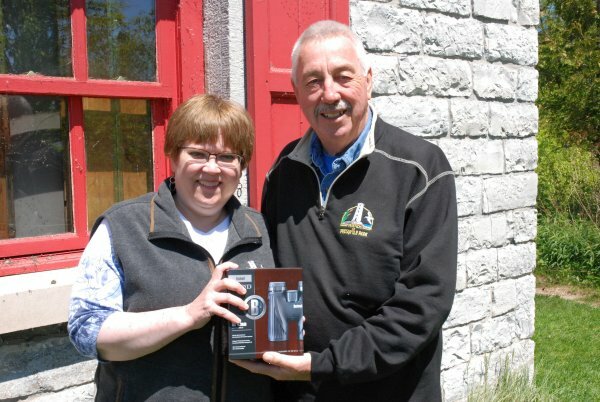 Barbara Foster receives her Bushnell binoculars from Pete Alker. The winner of the Bushnell binoculars is Barbara Foster, from Mississauga. Originally from Prince Edward Island, Barbara was encouraged by a birding mother. Having been birding for twenty years she likes to escape the city and take field trips with The Ontario Federation of Ornithologists. She is a regular at both Waterfowl, and Warblers and Whimbrels Weekends at Presqu'ile. She admitted that a big attraction of those weekends is The Friends’ BBQ, for lunch.